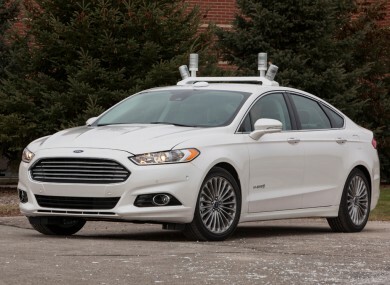 Ford is one company experimenting with self-driving cars. DESPITE THE FIRST self-driving car having yet to arrive, it’s expected that when the first ones arrive in 2020, the public will quickly adapt to them. A new report from IHS Automotive predicts that 54 million autonomous vehicles, including vehicles which allow both driver and autonomous control, will be on the roads worldwide by 2035. It’s also estimated that the total worldwide sales of self-driving cars will grow from nearly 230,000 in 2025 to 11.8 million in 2035. Globally, North America will have the largest amount of self-driving cars in 2035 with 29 per cent, or nearly 3.5 million vehicles. China will make up 24 per cent, or more than 2.8 million vehicles, while Western Europe will account for 20 per cent, or 2.4 million vehicles. By 2050, it’s expected that nearly all vehicles in use will be either self-driving cars or self-driving commercial vehicles. The report says that there will be “several benefits” to this development, for both drivers and pedestrians. As the number of self-driving cars enter the market, the accident rate will decrease to “near zero” although the report accounts for manually-driven cars crashing into them as this process changes. It also says that traffic and air pollution will fall since the cars’ driving patterns will be programmed to be more efficient. The first batch of self-driving cars will start off with limited capabilities, allowing the vehicle full control under certain traffic and environmental conditions and includes auto-pilot for highway travel and parking. Email “54 million self-driving cars to be on the roads by 2035”. Feedback on “54 million self-driving cars to be on the roads by 2035”.